Greenery, Mountains and cool breeze; reminds you of which hill station? I believe there will be an infinite list. But being an Indori what's your closest getaway? 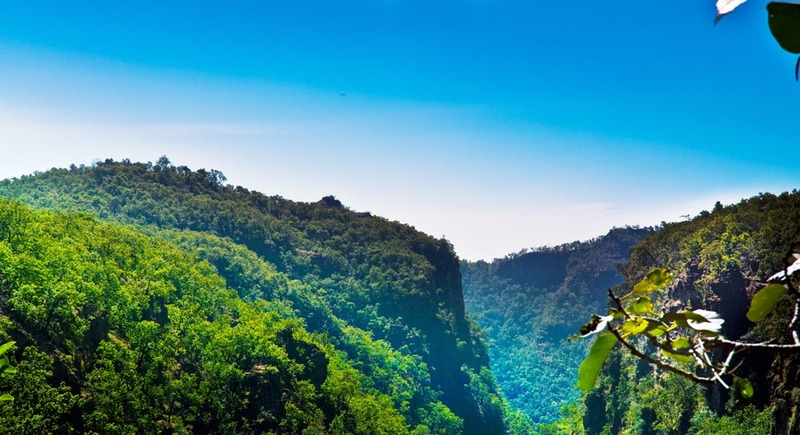 None other that the beautifully, embellished by nature and history, Pachmarhi lying amidst the Satpura range. Search your calenders and books this long weekend as soon as possible. Pachmarhi is sure to make you feel calm, the way you felt when you put your bare feet on the garden grass for the first time, as a child. You can hire a taxi and travel from Indore to Pachmarhi, as having your own vehicle leverages the options of stopping at various points and minimisee the tiresome walk. Enroute you can also enjoy the cool breeze of the beautiful hill station. Pachmarhi is the highest point in the central India region and the Vindhya and Satpura range; Dhupgarh at 1100 m is located here. The town is not very large, and most of its area is under the administration of the Pachmarhi Cantonment Board, serving the Indian Army. The civilian portion of the town is small, and lies towardsthe tip of a lake. It has some hotels and a movie hall. A bazaar runs through the small town. An club and golf course exist, for the usage of military personnel. A rarely used airstrip is situated near Dhupgarh. It is overrun with grass and is seldom used. Tigers are known to have been sighted near the airstrip. Panther sightings are common along the edge of the Pachmarhi Cantonment. Pachmarhi is a popular tourist retreat. Tourists visit pachmarhi through out the year. Pachmarhi is full of hotels and one can easily find a place to stay here. For tourists looking for economical options, the Youth hostel is the most apt place to stay. Other options include the Chunmun cottage, Nandan Van cottage among ather hotels and resorts. There are numerous hotels but only few of them are located in civil area of pachmarhi away from houch pouch market area to stay in peaceful location. Pachmarhi's elevation and the forests of the Satpuras, with their streams and waterfalls, are picturesque and home to much wildlife. Pachmarhi lies within the Pachmarhi Biosphere Preserve, created in 1999 to link two forest reserves into a larger wildlife conservation area at the highest point in Central India. Pachmarhi also has a lot of cave paintings in the forests, some of which have been dated to be as much as 10000 years old. Shown in the picture is the garden at the base of a tourist attraction called PandavaCaves, the caves are actually Buddhist in origin but the name persists. The place has rich timber reserves including teak, but being a part of a reserve no new construction or felling of trees is allowed. Having a rich and rare flora as well as fauna, Pachmarhi needs central and state government approval for any new construction outside the town area. Panchmarhi provides several options for food and one must not miss the Gujarati, Maharashtrian and Jain food here. You can relish these local delicacies here in one of their most authentic and rich form. Other than these, the town houses a number of popular cuisines and one won't run out of choices. The local delicacies of Madhya Pradesh include Dal Bafla, Biryani, Kebabs, Bhutte ki Kees, Korma, Poha, Rogan Josh, Jalebi, Ladoos as well as beverages like Lassi and Sugarcane Juice. So fight the summers, enjoy the spring and welcome the winter in your own state hill station, Pachmarhi. Book a taxi, find your people and enjoy the travel.